Hurtigruten fanblog: Explore beautiful Norway and the polar regions! 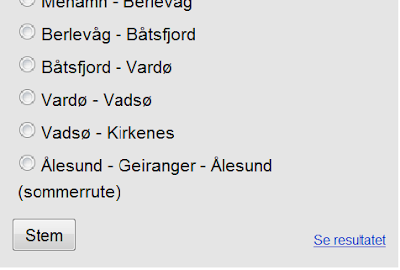 : Most beautiful Hurtigruten shorter trip - cast your vote! Most beautiful Hurtigruten shorter trip - cast your vote! If you're thinking about booking a cruise with Hurtigruten, you're maybe thinking about going the full distance, Bergen-Kirkenes-Bergen (The classic voyage). Or maybe just the one way. But with Hurtigruten you can also book shorter trips, from one port to another. But which shorter trip should you consider? The Norwegian newspaper Dagbladet (online) has a great article about Hurtigruten. 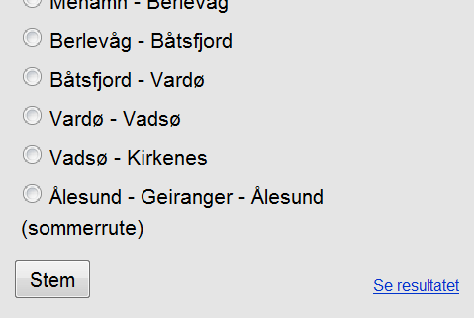 It's in Norwegian, but it also contains a poll: "Which Hurtigruten shorter trip do you think is the most beautiful?" Here you might get an idea about which shorter trip Hurtigruten passengers think is the most beautiful. Go to the article and vote, or see what others have voted! Written by Skipskatta time: 12:20 p.m.